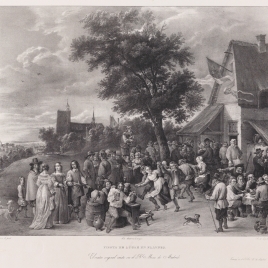 Peasants or villagers hold a feast in front of a tavern or inn, recognizable by its red flag. 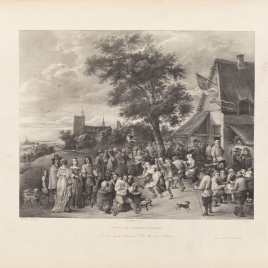 They drink, eat and dance to the music of a bagpiper standing on a barrel. 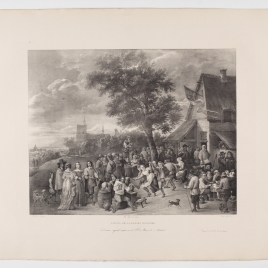 On the left, various distinguished personages, who stand out because of their different clothing, look on with a combination of curiosity and indifference. A large church in the background indicates there is a town nearby. 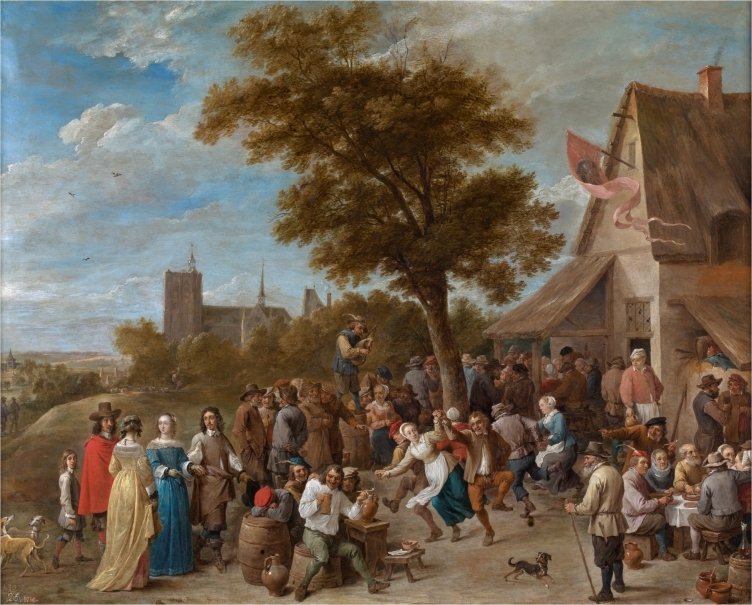 On the basis of works by his teacher, Adriaen Brouwer (1605/1606-1638), Teniers made innumerable genre scenes, but with a much more friendly treatment. Works on subjects very similar to the present one, which repeat groups of people and characters such as the piper and the dancers. The tree shown here was also used on several occasions. 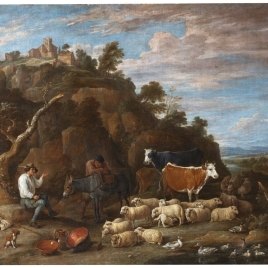 Here, it divides the scene into two parts: the volume of the house on the right, and the lines of perspective on the left, as was common in many of these works. 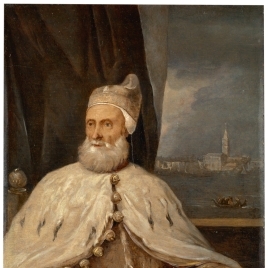 Sometimes, the artist as been identified as one of the noble personages in this work, although others considered one of those figures to be a portrait of the Archduke Leopoldo Guillermo, the painter´s patron. This work was probably acquired by Carlos IV. It was in the Royal Palace by 1814. Height: 69 cm. ; Width: 86 cm. Bagpipe: Personaje en el centro del cuadro con aerófono de lengüeta simple de la familia de los clarinetes: cornamusa de Europa Central. Está formada por un fuelle de piel, las montunas (especie de alveolos de madera donde se incrustan los tubos sonoros) y tres tubos de madera: el bordón, sin agujeros digitales, de sección cilíndrica y formado por tres piezas; el tubo melódico o “caramillo” es de madera, con sección cilíndrica y lengüeta simple. Está rematado con un borde de latón y no se distinguen los agujeros digitales frontales que solían ser siete y uno posterior; y el soplete de entrada del aire. Para tañerlo hay que colocar el fuelle o bolsa debajo del brazo izquierdo e inflarlo por medio de un tubo por el cual se sopla (soplete) y cuyo aire alimenta indirectamente los tubos sonoros. Al presionar la bolsa, una válvula cierra este tubo, impidiendo que el aire vuelva a la boca y el sonido se prolongue sin interrupción. En este caso el gaitero en plena interpretación y subido en un tonel para ser mejor escuchado, aparece con el fuelle erróneamente colocado, bajo el brazo derecho.